Chopsticks began life about 5,000 years ago in what is now China. Chopsticks are unique to Asia just as the fork is unique to Europe. The use and popularity of Asian chopsticks spread during the first millennia AD from the Han people of China to other regions of Asia to what are now Korea, Japan, Vietnam, Thailand and more. 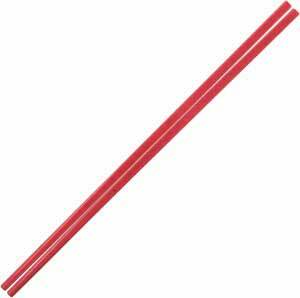 Today approximately one third of the earth's population use chopsticks every day. 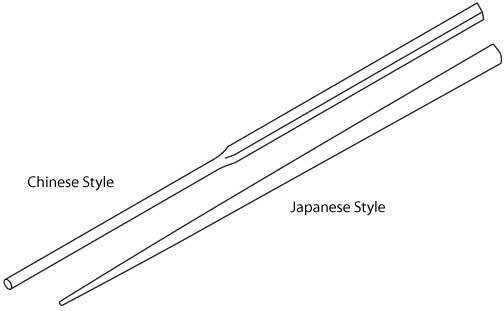 Asian chopsticks changed throughout history. They at times were short, around 7 inches, and sometimes long up to 13 inches. They were first made of wood and bamboo, and they've been made of other materials such as bone, ivory, silver, gold, jade and ceramic. However there is no one Asian chopstick style. Chopstick styles became unique to areas and cultures, and utilize materials and craftsmanship available in their regions. Chopsticks from Asia have many regional forms and styles. In China for instance chopsticks have become long, about 10-1/2 inches, and are typically square in the handle and round at the tip with little to no taper. Commonly they are made of wood, with sandal wood being a 'nice' luxury chopstick. This shape and length became popular during the Ming dynasty in the late 1600's and has remained to this day. Asian chopsticks in Japan are about 9 inches long and taper from the gently rounded handle to the tip. Japanese chopsticks come in many finish styles from traditional lacquers with natural materials used as decoration to colorful paints with beautiful prints. Like China, the style used most commonly in households are simpler wood chopsticks with little to no decoration. Asian chopsticks in areas south of China tend to be long, around 10 inches, round, and made of natural woods with little or no finish. In Thailand they specialize in layering woods of different colors - black, dark brown, red and blond - to create colorful patterns. In Vietnam chopsticks are sometimes made of bone. Korean Asian chopsticks are the most unique. Chopsticks there are made of metal, modern chopsticks being of stainless steel, and are paired with a spoon that closely resembles a western spoon rather than a Chinese spoon. The chopsticks are about 9 inches long but are flat like the handle of a fork. The handle is broad and flat and the chopsticks tapers in width only until the tip is almost square. Asian chopsticks are truly amazing works of art. Poems and riddles have been written. Dastardly deeds have been performed with them. You'll find all styles of Asian chopsticks at EverythingChopsticks.com including chopsticks from China, Japan, Korea, Thailand and Vietnam. Have fun browsing all the beautiful styles and works of art that are chopsticks.